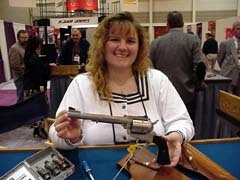 American Western Arms imports a full line of handguns and long guns for Cowboy Action Shooting. 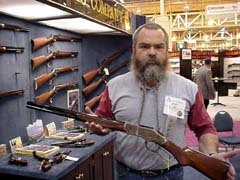 They also offer an extensive catalog of accessories and clothing for the Cowboy shootist. Quality of their overall line appears to be very good. We will be conducting a more extensive evaluation of their product line soon! Armalite is offering a new fully-automatic airgun that is a very exciting new design. 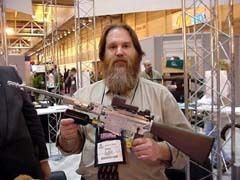 Pictured with the gun is the man who designed the gun. 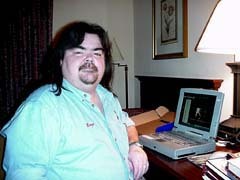 He is an impressively-intelligent, nice guy named Doc (I can't remember his last name, I'm bad about that - my apologies) who came up with an ingenious ground-breaking design while living an the wilderness of Alaska. 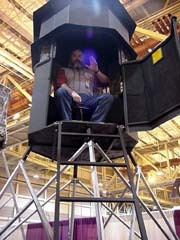 Armalite wisely hired this guy as soon as they learned of what he was doing up there. Doc's design offers an extremely high cyclic rate while offering muzzle energy exceeding that of the .22 Rimfire in a rifle that is ATF legal (nyah, nyah!) because it is an AIRGUN. Equipped with an ample pellet magazine, this has to be one FUN gun! One air canister is shown affixed to the gun in the picture, but there are fittings on the bottom of the frame (where an AR-15 magazine would go) for 2 more canisters, meaning you could shoot for hours without a refill! Armalite says this gun will be available very soon at a price far lower than I expected. Doc and Armalite are at the forefront of some exciting things that are happening in the airgun industry, and I was honored to make his acquaintance. Big Oak Outdoors is offering their new "Buck Hunt" stand, which compares favorably to competing designs, at very competitive prices. Browning has introduced their new "Gold Fusion" 12-gauge semi-automatic shotgun. Browning says the new guns offer improved handling qualities and accuracy along with softer recoil. 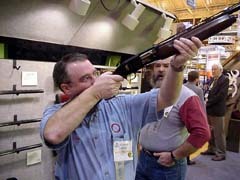 Greg was very impressed with the handling of Browning's new gun. Butler Creek's new "Packer" system for Ruger's 10-22 semi-automatic .22 carbine (and its many clones) allows the gun to be taken-down quickly without tools for portability and barrel changes without sacrificing accuracy. Freedom Arms had no new guns for 2001, so we just drooled over the Premier Grade .454 Casull like we always do. The Premier Grade is an incredibly well-made SA revolver that is as strong as a bank vault. Fit and finish are superb on these guns without exception, with barely-visible barrel-cylinder gaps, recessed case heads, and grips that look as though they grew on the gun. 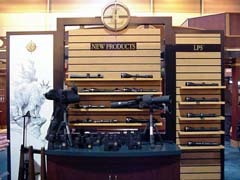 Leupold's new products for 2001 include their LPS (Leupold Premiere Series) line of rifle scopes. These scopes are Leupold's top of the line, and though they ain't cheap, they offer some very clear optics. Multiple lens coatings on each surface, precision adjustments, and a transferable lifetime warranty are just a few of the reasons Leupold calls these scopes "Premiere". No Intermediate Eye Relief ("Scout") or Long Eye Relief (handgun) scopes are available at this time, but Leupold promises to expand the LPS line steadily to include these. 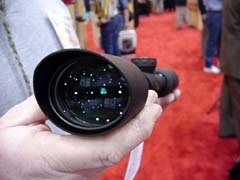 Leupold is also offering a new line of binoculars designed to offer premium features at competitive prices. Ever find yourself in a tree stand on opening morning of deer season, trying to suppress that nagging cough that crops up when the cold hits your lungs? You fight and fight, finally letting fly with a muffled cough just before you see that white flag bouncing away from you. Enter Mole Town Products' "Cough Muffler", and ingenious little silencer designed for you to cough into. The Cough Muffler does a great job of silencing a cough, and the interior filter is washable so it doesn't breed germs all season. Look for a more extensive GunBlast.com review of this product soon. New from Navy Arms for 2001 is a nice-looking 1873 Carbine for the Cowboy Action Shooter. This imported rifle exhibits good fit and finish and seems to lock-up pretty tightly. Navy Arms says we'll be getting a test piece soon, so stay tuned! Phil's Hunting Accessories' "Ryfle Rest" is a nifty little rubber-type rest with a fitting underneath that allows it to be mounted on a standard camera tripod for portability and ease of use. 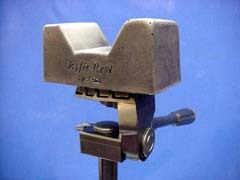 The rests come in many different shapes to match different barrel/fore-end configurations, and they are very reasonably priced. 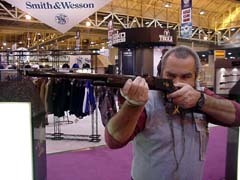 Phil was nice enough to give Jeff a test piece at the SHOT Show, so look for a complete evaluation soon at GunBlast.com. Among Ruger's new rifles for 2001 is a handy little Number One Carbine. Lightweight, short, chambered in .45-70 Government and equipped with a gray-laminated stock, this little stainless rifle would be a worthy companion in the field. Target Shooting Inc. is offering an excellent precision rifle rest for the non-competitive shooting market. This robust unit is so effective, it has been deemed illegal for competitive shooting! Sturdy and stable, this rest is adjustable in so many ways to accommodate such a wide variety of rifles and shooting positions that Jeff bought one at the SHOT show just for testing rifles for GunBlast.com! 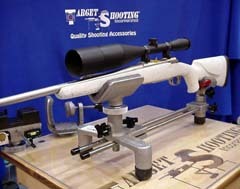 New from Tasco is their EXP Series scope line. Initially offered in a good variety of sizes and magnifications, the EXP line is unique in that the oval-shaped objective bell offers a wide field of vision with sharp optics and minimal distortion. The competitively priced scopes are said to be stronger as well; we'll see about that after Tasco sends us some units for testing! Walther introduced its new P-22 .22 Rimfire semi-automatic pistol. To be brought out at an incredibly low price, Walther says this pistol will be at least as accurate as anything on the market. While I don't like the current trend of trying to make polymer-style firearms look like running shoes, I have to admit that the Walther P-22 handles and points exceptionally well. 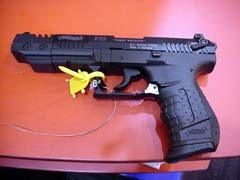 If the accuracy of this pistol is anything like Walther says it will be, I'll be buying one of these for myself! From Winchester comes the Model 1886 Extra-Light High Grade in .45-70 Government. This dandy little rifle handles very well, and we like the extra-light option. While the High Grade option is beyond the financial reach of many, this rifle is also available in standard grade, and I cannot praise the .45-70 cartridge enough to do it justice. Winchester's Model 1895 High Grade in .405 Winchester is an excellent gun in an excellent caliber. 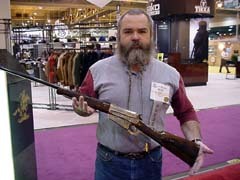 It was good to see the 1895 in .405 Winchester, long one of Jeff's favorites. One of my favorite lever-action rifle designs for its reliability and its box magazine, the High Grade is an exceptionally beautiful piece, with the large flats on the receiver making wonderful engraving panels. 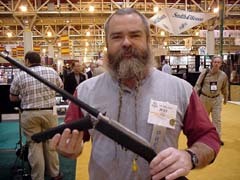 Well, that's it for SHOT show 2001, folks! Next year the SHOT show will be back in Las Vegas in early February, and we look forward to seeing what a full year of a gun-friendly, freedom-loving administration in Washington will bring! 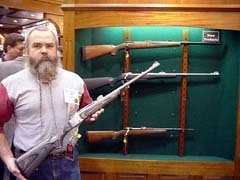 Keep your eye on GunBlast.com for reviews on many of the products you saw here, as well as others of interest to us all. 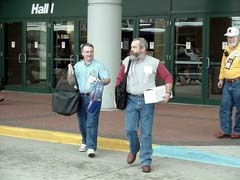 Greg and Jeff leaving with the goods - next SHOT, February 2002!